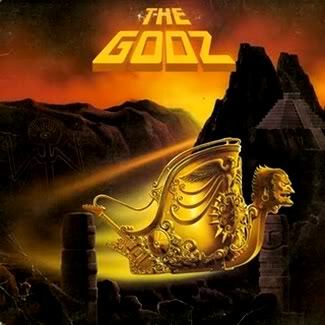 THE GODZ – S/T: The Tragic Majesty Of A Rock & Roll Machine – Schlockmania! Critics might disagree but Your Humble Reviewer believes the 1970’s was the prime time for hard rock. Not only did you have all the prime acts – Led Zeppelin, Kiss, Deep Purple, UFO, Van Halen, etc. – writing the rules of the genre, you also had a string of lesser known acts knocking out their own classics on a more intimate scale. Sometimes they’d only put out one or two albums but they’d always leave behind at least one worthy milestone before burning out. 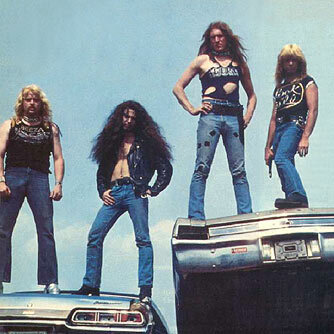 A prime example of this second category of classic hard-rockers is the Godz, a biker-band who opened for countless major acts during the 1970’s and built up enough of a name to headline shows before they ever got a record contract. Their original lineup released two albums via Millenium, a sublabel of Casablanca that snapped them up as a tough-guy answer to Kiss. The classic of the pair is the self-titled debut, a killer of an album that today’s hard-rock scholars discuss in hushed tones of reverence. A word of warning before we get started: don’t expect Judas Priest-style fret-sizzling fireworks from The Godz. 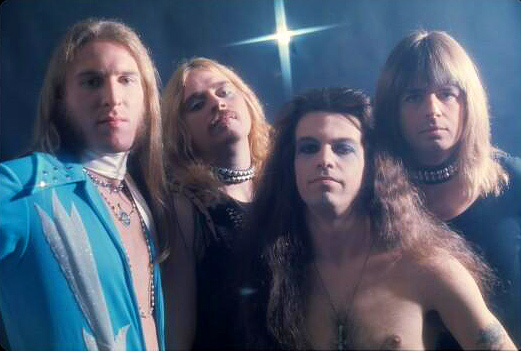 This was a band that was raised on traditional rock and roll and developed their own loud, mutated and delightfully sleazed-up variation on the form. The end result has toothy guitars and booming drums yet also places an emphasis on sing-along choruses and other catchy hooks. Indeed, “Baby I Love You” sounds like AM hit-era Grand Funk on a hard-rock bender (coincidentally, ex-Grand Funk drummer Don Brewer produced this album) and cuts like “Go Away” and “Relentless” could pass for southern rock, albeit with heavier guitars. However, those early cuts merely set the listener up for the kill. Pretty soon, the album is dishing up killers like “Under The Table,” which starts as a frantic rocker and gives way to an unexpectedly graceful dual-guitar instrumental second half that soars like Wishbone Ash reconfigured for a biker-bar audience. “Cross Country” is another winner in this vein, a moody midte mpo ode to the joy of cross-country travel that boasts a formidable guitar-solo midsection. This song is to the Godz what “Ride On” is to Bon Scott-era AC/DC. The band also performs a killer cover of the Golden Earring classic “Candy’s Going Bad” for their final cut. It strips out the funky elements and subtleties to rebuild it as an arena stormtrooper. The first half bludgeons the vocal part of the song into submission, reworking it into a high-octane guitar stomper. This sets you up for the instrumental second half, which bypasses the downtempo mellowness of the original version in favor an insane, intense noise-rock jam that would put the wildest Krautrock band to shame. However, the definitive moment of The Godz is the second-side closer, “Gotta Keep A-Runnin.” This rifftastic mini-epic starts off as an independence vow/kiss-off to a chick anthem for lead singer/group mastermind Eric Moore but transforms something unforgettable when it reaches its midsection. At this point, the band begins to vamp as Moore takes center stage and delivers a monologue about how society fears the Godz for what they represent and predicts that they are destined to crash and burn living the r ocker’s lifestyle… but they’ll have the last laugh because they and their fans are “rock & roll machines” destined to take over the world. It all culminates in a triumphant growl-chant of “The Godz are rock and roll machines!” The end result is absurdly cartoonish and totally heartfelt all at once – and that’s the duality that defines classic schlock. As fate would have it, Moore correctly predicted the end of his own story. The group fizzled out their second album, the classic lineup of the band broke up and Moore drifted on with additional versions of the band that stayed on the road but never recaptured the glory of their initial waxing. However, The Godz remains a potent document of how rock & roll machines ruled the arenas of the 1970’s. If you revel in obscure 1970’s hard rock, it’s a must. CD Notes: after years of from-vinyl bootlegs, this album has finally gotten a quality CD reissue from Rock Candy Records. The remastering does justice to Brewer’s muscular production and it also includes a nice, full-color booklet. Martin Popoff supplies a re-edited version of his essay/interview piece on the album from his Ye Old Metal 1978 book: it’s a fantastic read that includes stories like how the band’s stage show was inspired by the work of Albert Speer and how the band would relieve their stress during the recording of the album by going outside to shoot off guns between takes!